You probably know viruses as the demons behind your nasty cold, the not-quite-living monsters that infiltrate cells and plug in their own genetic material. But the horrible little buggers might have been crucial to forming the cells in our own bodies today. A team of University of California, Santa Barbara scientists observed bacteriophages, a type of virus, invading and destroying their bacterial host—in other words doing their usual, terrible thing. But before the bacteria died, the spindly little devils took control of their cells and produced a little compartment for viral genetic material to divide in. Some scientists theorize that this is how our cells evolved to have nuclei. The scientists first stuffed their test bacteria full of proteins that fluoresce under a special microscope, attached to other proteins that are important to the viral lifecycle. When they introduced the viruses to the bacteria, they filmed as the fluorescing proteins enveloped the viral genetic material into a sort-of nucleus—bacteria don’t have nuclei to store their DNA like our cells do. 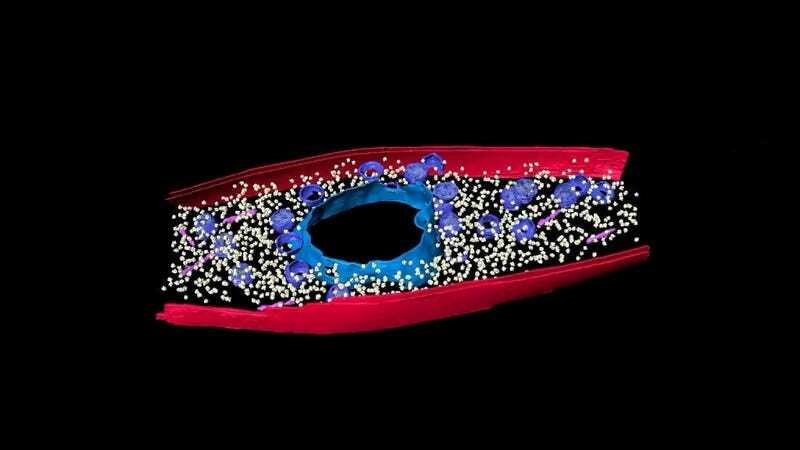 Another protein remained outside the shell and held the gene-sack in place. The team finally froze the bacteria so they could study them with higher-detail cryo-electron tomography, said Chaikeeratisak. They published their results today in the journal Science. Sure, the results show another example of the diabolical ways that viruses operate, using their host’s corpse to create a little home for proliferating inside of. But they also support a theory called “viral eukaryogenesis,” which posits that our own cells acquired their nuclei in the way this study describes. The observations impressed other scientists. “The results of this study could be pivotal for understanding how life evolved from relatively simple organisms into the complex and diverse life-forms that inhabit our planet today,” wrote Sarah Maddocks, lecturer in Microbiology for at Cardiff Metropolitan University, in The Conversation. So next time you have a viral infection, consider that those tiny invaders might have shaped you in their own image and turned your cells into whatever piece of meat best housed their viral genes.